This thesis is part of the project ’Postural control after lower limb amputation; changes in body representation and the recovery in postural control’. The project is the result of a collaboration between the Center for Rehabilitation Medicine of the University Medical Center Groningen, the Netherlands and the Center for Human Movement Sciences of the University Medical Center Groningen, University of Groningen, the Netherlands. 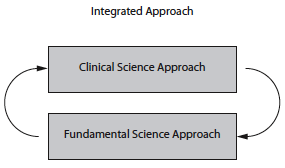 Figure 1: The integrated approach unites two types of research: from a clinical approach and from an fundamental science approach. Findings from the clinical science approach are tested in the fundamental science approach and visa versa. This integrated approach unites two types of research: research from a clinical science approach and research from an fundamental sciences approach (figure 1). The clinical research was performed by medical specialist for rehabilitation Aline H. Vrieling 8. Her thesis (figure 2A) formed the base for the current thesis (figure 2B). Many of the findings that were reported in her thesis are studied from a biomechanics perspective in the second part of this project. Parts of the datasets that were reported in her thesis are also used in the current thesis. 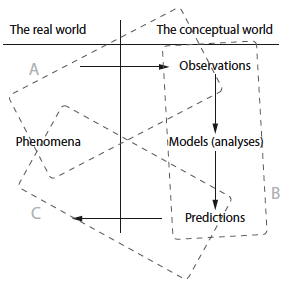 Figure 2: An elementary depiction of the scientific method that shows how our conceptual models of the world are related to observations made within that real world 53 (original figure from Dym, 2004). A: Phenomena and observations, described in the thesis of dr. A.H. Vrieling (2009). B: Observations, models and predictions, described in the current thesis. C: Predictions verified in the real world.